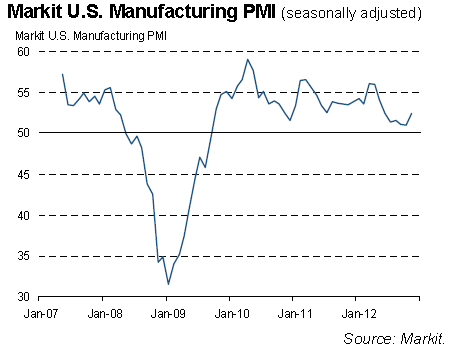 US Manufacturing PMI (flash) is showing some stabilization, although manufacturing expansion remains slow. MarketWatch: - Markit said its preliminary flash manufacturing purchasing managers index, which is based on around 85% of usual monthly replies, rose to 52.4 in November from 51.0 in October to indicate a moderate manufacturing expansion overall. Output, new orders and employment each accelerated and stayed above the 50 level indicating growth. There is one troubling sign however. Manufacturing input prices seem to be rising faster than the output prices. The table below shows the full breakdown of the index. This may indicate that manufacturers don't have the pricing power to fully compensate themselves for rising costs. 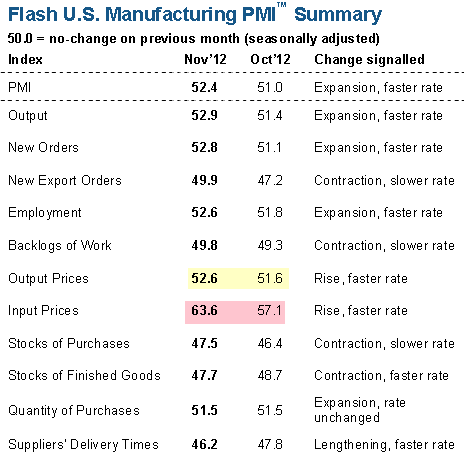 Markit: - The sharpest rise in input costs for eight months was indicated by November PMI data. Greater demand for raw materials such as metals and limited supplies for some goods due to unseasonably bad weather had both contributed to higher input prices in the latest survey period. The relative moves of the two indicators will be important to watch going forward because this could be a sign of declining manufacturing margins.